A Hale Irwin personal appearance, Hale Irwin speaking engagement, or Hale Irwin endorsement will reflect well on your company. To hire Hale Irwin now for any corporate appearance, fundraiser, motivational speaker event, personal appearance, autograph signing, or website endorsement please contact our celebrity agents at 1-877-6-SPORTS. We will contact Hale Irwin or contact Hale Irwin's agent and provide you with the booking fees and availability immediately upon your request. Direct Sportslink is the only sports speakers bureau and talent booking agency based in the United States securing only sports talent for corporations, associations, and organizations for motivational speaking engagements, personal appearances, and endorsements. We are the premier sports celebrity booking agency and a sports celebrity procurement expert. Accordingly, we will provide you with any relevant Hale Irwin website information and booking agent details so that you can hire Hale Irwin for your next event. Irwin had 20 victories on the PGA Tour beginning with the 1971 Sea Pines Heritage Classic and finishing with the 1994 MCI Heritage Golf Classic, and won prize money of just under six million dollars. His three major championship titles were the 1974, 1979, and 1990 US Opens. 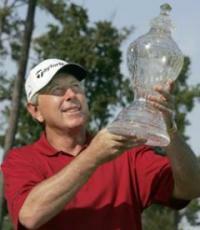 His 1998 win at the U.S. Senior Open came at the Riviera Country Club. Irwin qualified to play on the over 50s Champions Tour (formerly the Senior PGA Tour) in 1995 and has enjoyed even greater success at this level than he did on the PGA Tour. He has won over 65 Champions Tour events. Based on your interest in Hale Irwin as a speaker or for a personal appearance, Direct Sportslink has provided you additional links below for other sports talent with similar appearance fees, speaker topics, and categories that match Hale Irwin.